Solotica Hidrocor Topazio is a deep blue colored lens that fades into golden yellow at the center, giving you the most radiant blue eyes. A top selling blue color, this lens looks great on all skin tones and comes without a limbal ring, giving a natural and fresh look. Solotica Hidrocor Topazio is a beautiful deep blue color lens that comes without a limbal ring for a natural look. It is one of the top selling lenses across the Solotica collections and customers in the USA, UK, Canada, France, and Spain love its rich and vibrant color. Where can souKare deliver Solotica Hidrocor Topazio lenses? souKare delivers these stunning colored contacts over the world. Delivery time is normally 2-5 business days for most countries. For major cities such as Munich, Miami, San Francisco, New York, Istanbul, Amsterdam, Barcelona, London, Paris, Melbourne, Los Angeles, Montreal and many more, delivery can take as little as 2 days. Within Dubai, we can deliver within 90 minutes. For all other Emirates in the UAE including Sharjah, Ras al Khaimah, and Abu Dhabi delivery of all Solotica lenses takes just 1 day. Why wear Solotica Hidrocor Topazio? This spectacular colored lens has a deep blue color that shifts to yellow in the center to give the most radiant and natural looking blue eyes. 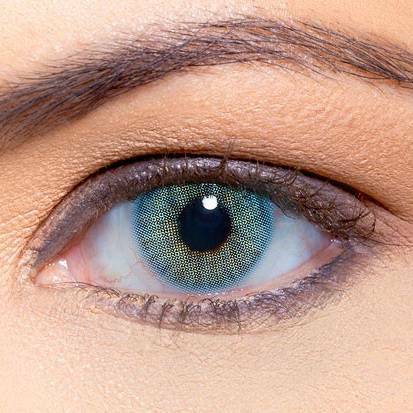 If you are looking to transform your appearance with blue eyes then this color is a perfect choice. Just like all lenses in the Solotica Hidrocor selection, this lens not have a limbal ring which gives it a very realistic appearance and natural appearance. Is Solotica Hidrocor Topazio suitable for dark eyes? Yes, it will cover dark eyes and will give you those stunning blue eyes that go with all skin complexions. Go from daytime to a night on the town with these gorgeous lenses. Which other colors from the Hidrocor range should I consider? This color top choice for a blue lens because of its rich and natural tones. For an even more vibrant pop of bright blue color, Hidrocor Azul is the one to consider. Among the blues, Hidrocor Grafite is also popular because of its grayish blue color. If you are looking for a lighter shade of blue then Hidrocor Ice is the lens for you as it has a one-of-a-kind frosted blue color. Brown shades: Hidrocor Avela is a richer hazelnut shade of brown while Hidrocor Ocre is a lighter more subtle hazel shade that blends into gray during the day. Gray shades: Hidrocor Quartzo is most popular among the grays for its bold combination of gray and blues whereas Hidrocor Cristal is a lighter shade of gray. Green shades: Hidrocor Mel is a favorite because of its warm pistachio shade while Hidrocor Ambar is loved by many because of its darker olive green color. For a bold and vibrant shade of green consider Hidrocor Verde. souKare delivers all colors worldwide including Canada, Australia, UK, USA, Germany and France. Delivery time is normally 2-5 business days for anywhere in the world. For major cities in the world such as Paris, Munich, Barcelona, Zurich, Toronto, Amsterdam London and Melbourne, and big cities in the USA such as New York, Las Vegas, San Francisco, Miami, and Los Angeles, delivery can take as little as just 2 days. How are Solotica Hidrocor Topazio lenses sold? They are sold as single lens for each eye. You need to buy two lenses to complete a pair. Each lens can have the same or different powers as per your prescription. Check your recent medical prescription before choosing the power. If you are looking to buy these contacts only for the aesthetic purpose, select Plano as the power option. How long can I wear Solotica Hidrocor Topazio lenses for? Like all lenses within the Hidrocor, collection, these lenses can be worn daily for up to one year. Important information for contact lens users: do not use contact lenses if you have any ocular disease or feel discomfort, blurred vision, excessive tearing, redness, etc. If you have any of these symptoms make sure to see your ophthalmologist right away. Can I sleep with my Solotica Hidrocor Topazio contact lenses? You must not sleep with these contacts. Make sure to remove these lenses before going to bed. These lenses should always be stored in a sterile lens case, each time with fresh contact lens solution. We recommend contact lens solutions suitable for soft contact lenses that should multi-purpose and high quality. A number of such solutions are available in Solutions and Drops section of our website. What is the correct way to wear and care for my Solotica Hidrocor Topazio lenses? Cleanliness is a vital part of proper contact lens care and hygienic handling of your new Topazio lenses. Your hands should be clean and free of any foreign substances when you handle your lenses. How to care for my new Solotica Hidrocor Topazio lenses? It is easy to care for your these lenses. Most important is to follow a consistent cleaning regiment. You will first need an effective multi-purpose lens solution. This will clean, condition, disinfect, rinse and help store soft contacts. Your contact lenses are now ready to wear. If any debris remains on them, continue to rinse with the multi-purpose solution until they have been fully cleaned. Love this color, its perfect for my look!